Alert ⋆ 100% Private Proxies - Fast, Anonymous, Quality, Unlimited USA Private Proxy! I don’t get email alerts for a specific list view filter.. Alerts for other generic list/docs/workflow are all working… Can you guide me please? Checked all the Immediate alerts job, List–> Advanced settings –> email etc..
All the settings are correct. How can I optimize a alert system that processes 1000 request / hour? I am building a solution where IoT-devices send in measurement-data to a API thats hosted on AWS. For each measurement-type the user can set a threshold value, that when reached will trigger an alert to be sent out. My design is based on events, so each new measurement thats recieved in the API generates a work item on an AWS SQS-queue. A lambda-function then processes the work-item and reads all the threshold-alerts for that particular device from a database, and checks if any of the recieved data has passed the threshold. If the threshold is passed, it sends out an alert email. The API processes about 1000 requests each hour and the reading of all threshold-alerts from the database is getting expensive/time consuming. So my question is if there is a better way to design this alertsystem? I was thinking of adding a cache-layer that will cache all threshold-limits since they dont change that often, but this means I have to use a distributed cache and still make a roundtrip via HTTP. I have created a website using nodejs . And using ssl certificate from sslforfree.com . It is working fine on desktop and i checked it in SSL Checker it is working fine . 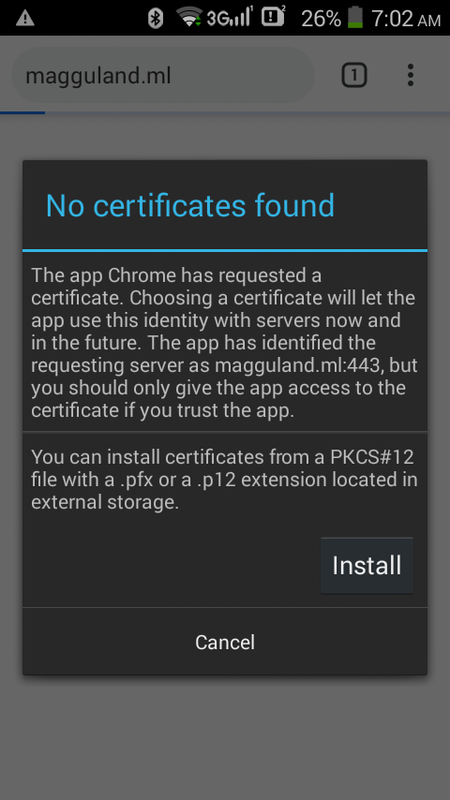 But in mobile it is showing alert No certificates found. Please see the image attached. But, I was unable to find any proper documentation on the supported CAML for Filter. E.g. <In> is not supported as well as Type="Choice"
So my question is, what query can I use to filter on a multivalue managed metadata field? So far I have tried using the GUID of the term, the lookup id of the term in the taxonomy hidden list, the text-value of the term, the <contains>-operator, the <eq>-operator but without any luck. The two lines on the left, and the two buttons on the right are unreponsive to mouse manipulation, the only button that is reponsive is Reconnect, which will in-fact reconnect to me to the display I’ve disconnected from – even if someone else is already connected to it. I also cannot drag the alert, nor does a context menu appear on right-click. I have had a contract with CPX-Traffic manager named Augusto that he'll bring me traffic and I will pay him on a CPA basis. After a month of sending the money they were only able to provide me with 5 conversions!!! 5 conversions in one month totalling about $ 10 from the $ 1000 I sent them!! !